Give us a call before you install your new floor coverings. Floor preparation is the final part of the floor removal process. It is also the most important. Having floors that are both level and properly prepared for the flooring type you wish to install, is crucial in ensuring a smooth and seamless re-lay. At Hard Labour we can take care of your floor removal from start to finish, or we can simply help put the finishing touches on your subfloor. Subfloor preparation requirements for each floor will depend on the type of floor you are installing. will need to be completely free of dust and sand. Carpets subfloors have slightly more generous tolerances (8-12mm over three continuous meters) and will usually have a subfloor of concrete or wood such as plywood or MDF. For concrete subfloors, we will ensure they are clean and dry. Wooden subfloors will need to be made of flooring grade material and must be level. 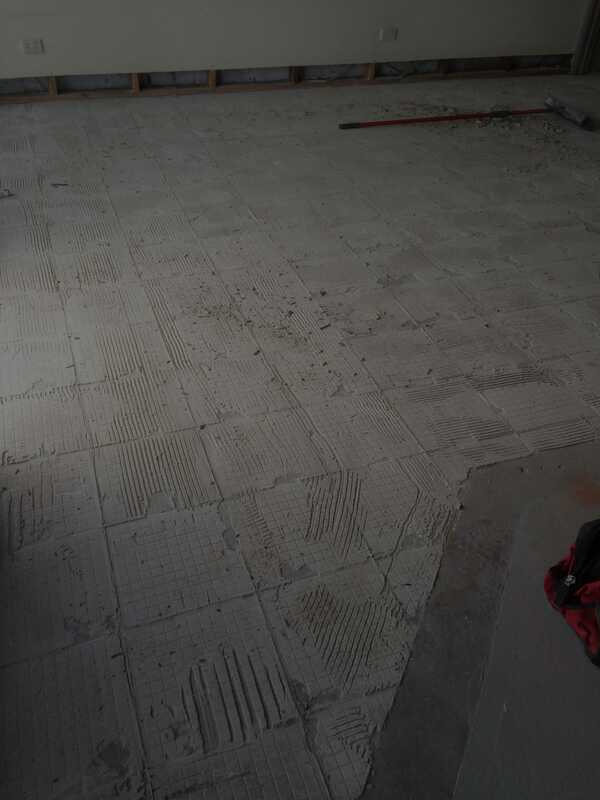 Tiles will usually be laid on concrete or plywood. If your subfloor is concrete, we may need to repair cracks and uneven patches to ensure the concrete is level. With the preparation of wooden subfloors, it is important to ensure that the subfloor has adequate load bearing capacity, because tiles can be a very heavy flooring type. Cork floor subfloors must be level and flat, with no adhesive remaining. They have a tolerance of no more than 5mm per 3m radius. Vinyl can be laid on concrete and wooden subfloors. The subfloor specification for vinyl is a tolerance of 4mm over 2m. Why do I need a professional to prepare my domestic floors? It is important to get floor preparation right, because it has a great bearing on the quality of the finished job. Our knowledge has been acquired over years of experience, making us experts in subfloor preparation. Don’t risk the quality of your finished product or renovation project on jack of all trades or cut-price workmen, who have a “close enough is good enough” mentality. At Hard Labour we don’t believe in a “quick buck” at our customers expense, and we will stay until the job is done to the highest professional standards. At Hard Labour, we don’t just want to remove and prepare floors, we want to build lasting relationships with customers who will become repeat customers over time. If you would like a free quote, please get in contact via the quick and easy form on the right-hand side of this page and we’ll have all of your subfloors (un)covered in no time!